Me standing on Ellison's Rocks, looking up at the sheer drop and the Forty Steps on the Cliff Walk in Newport, RI. Photo by Melissa Martin-Ellis, http://www.mellissart.com/. A favorite short story is Jack Finney’s “Contents of the Dead Man’s Pockets.” Plot: ambitious employee climbs out an eleventh-floor window to retrieve his career-boosting project notes. A couple of weekends ago I went to Newport, Rhode Island. I went to visit friends and to reconnect with a very special place: the famous Cliff Walk, which lately I’d been pining to see. I walked with Mark and Melissa and beheld the cerulean sky, the peacock ocean, the swirling aquamarine eddies, the jagged cliff sides composed mostly of metamorphic rock. We stopped at the head of Newport’s famous Forty Steps, which have been around for a couple of hundred years (although restored now—the originals were wood) and was where servants from the Mansions met to hang out. The steps cut between Ellison’s Rocks and Conrad’s Cave—places which, although a bit scary to reach, are navigable, and I’ve ventured to both in the past. It was high tide, though, so I couldn’t go to the cave (you can really only go to at low tide; during high, it’s like the pirate’s hole in Disney’s The Rescuers). 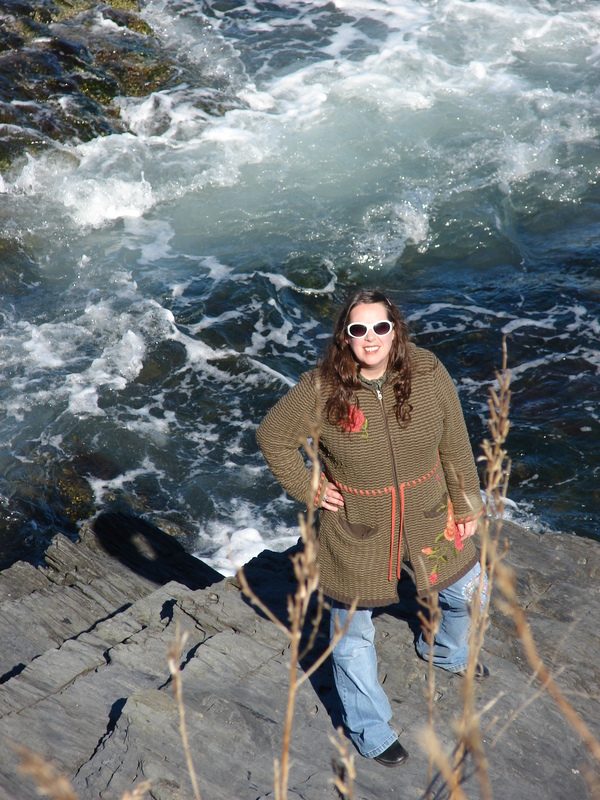 So I instead descended the steps and shimmied through a chasm in the outcropping to stand on Ellison’s Rocks. When I got to the bottom, I looked straight up. Conrad's Cave. The entrance is toward the right of the photo. I wish I'd gotten a video of the water pouring in -- it's stunning. Photo by Melissa Martin-Ellis, http://www.mellissart.com/. There were the steps, and the sheer cliff right beside it. The contrast struck me. I have some experience with rock climbing, and I remembered that when you’re going to rappel, it’s pretty intimidating to stand on that ledge and look down—it’ll be over quickly, but it induces vertigo. Even though the stairs take longer, the descent is less traumatic. But either one will get a person to the same spot. Melissa gave me a few older postcards of Newport; she told me when they were dated, but I forgot. Anyway, here's what the cliffs look like. 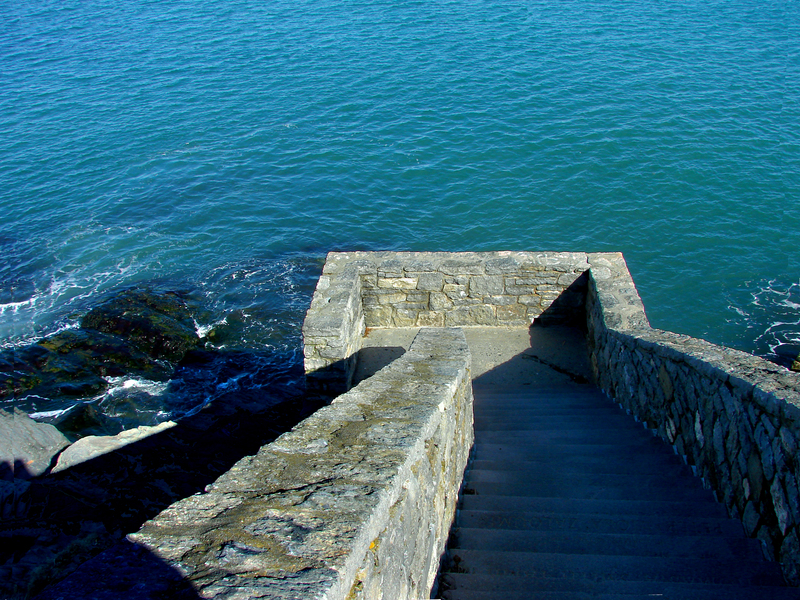 The Forty Steps. Photo by Melissa Martin-Ellis, http://www.mellissart.com/. I put inner conflict over making a critical decision in this context. When we face that giant leap and contemplate a net-free plunge, it can be a long way down, baby. When we, however, break that conflict into smaller formations and conquer each one at a time, it may take longer, but it’s less overwhelming. And the outcome is the same. One of the most interesting lines in “Contents” comes at a moment just after Tom has set his feet on the window ledge, when he’s “eleven stories above the street, staring into his own lighted apartment, odd and different-seeming now.” It occurred to me that after the conflict has been resolved and we’ve lived with the decision for a little while, we often look back on it and realize we’ve made the right choice. That the alternate life we could have led somehow looks odd. And we may even forget why we thought the decision was so difficult to make in the first place. 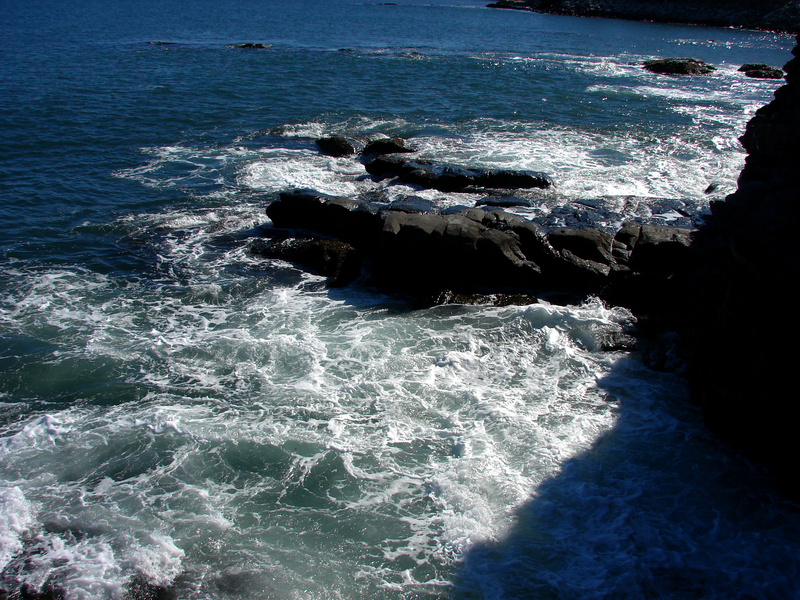 A view of the shoreline. Photo by Melissa Martin-Ellis, http://www.mellissart.com/. The information I’ve cited appears on page 1. Jack Finney, “Contents of the Dead Man’s Pockets,” in Adventures in Appreciation Annotated Teacher’s Edition, ed. Judy Allen-Newberry, Anthony J. Buckley and Richard Tuerk (Orlando, San Diego, Chicago and Dallas: Harcourt Brace Jovanovich, 1989), 102. 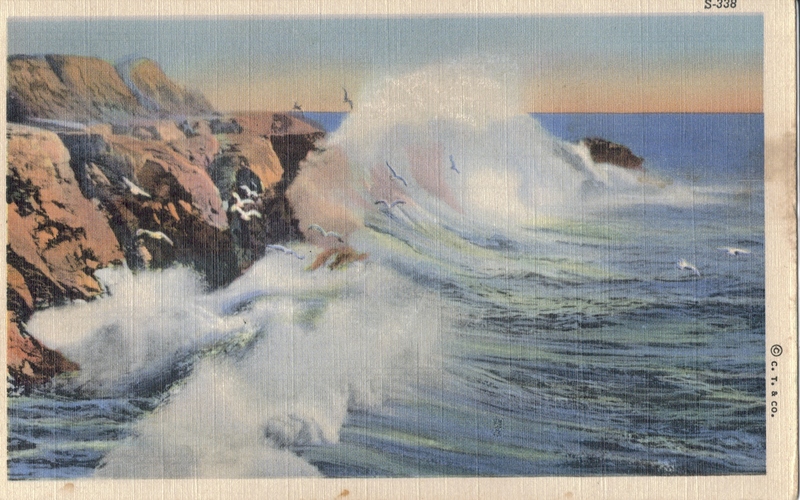 Another old postcard, this of a common scene off the Cliff Walk or Ocean Drive. Melissa Martin-Ellis is an illustrator, writer and photographer, and Vice President and Creative Director of Millennial Publications. Her artwork and writing have been featured in numerous New England exhibits and galleries, as well as in print media such as the Redwood Review, Newport This Week, Newport Life Magazine, The Boston Globe, Horseman’s Yankee Peddler, The Newport Round Table Anthology and Balancing The Tides. She is the author of three nonfiction books, The Everything Guide to Writing Graphic Novels, The Everything Photography Book and The Everything Ghost Hunting Book for Adams Media. She the co-moderator of the Newport Round Table Writers’ Group in Newport, Rhode Island. She is currently working on a graphic novel project about the disappearance of the honeybee and collaborating with her husband, author Mark Ellis, on a paranormal thriller novel. You can check out her stunning photos of Newport at http://www.mellissart.com/. Posted on March 21, 2010, in Deep Thoughts & Fun Stuff and tagged Beach, Beach Cliffs, Conflict, Conrad's Cave, Contents of the Dead Man's Pockets, Ellison's Rocks, Melissa Martin-Ellis, Newport. Bookmark the permalink. 10 Comments. 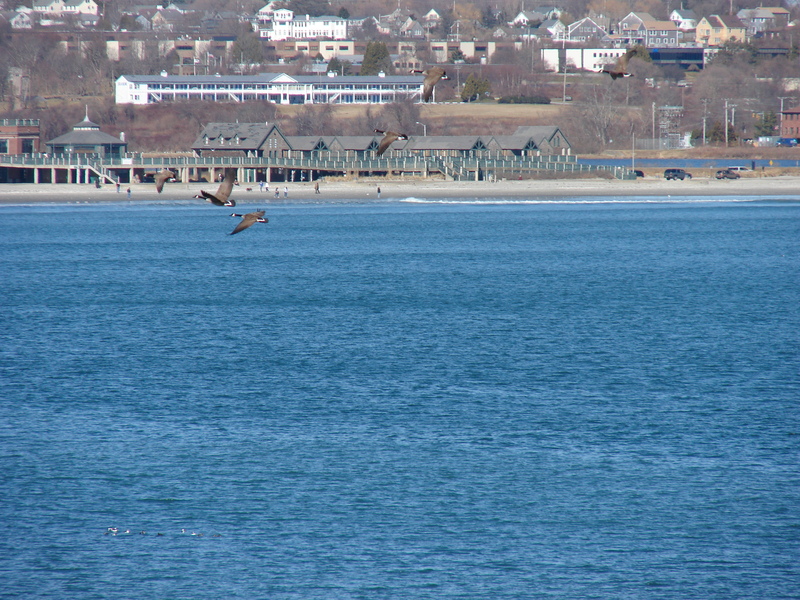 Those are some great shots of the Newport Cliff Walk. 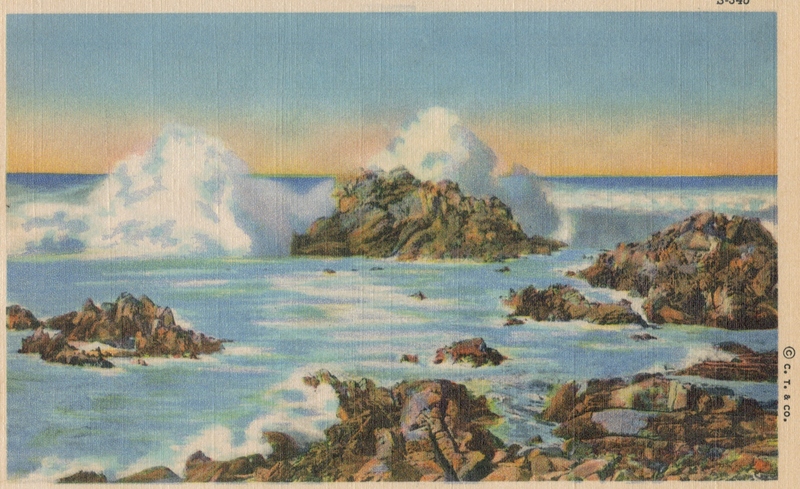 I like the old postcards too. I recently came across some old postcards that my grandfather had with various Newport scenes, and I hope to get them up on my site in the near future. Wow, thanks! Yeah, that’s just a small sampling of Melissa’s fine work. She’s photographed all over Newport for years, and her photos, to me, just capture the spirit and beauty of the city — which I’ll be moving to soon, and I can’t wait! I have other old postcards of Newport from a “folio” that I found — you know, one of those vintage “folios” where it’s like 10 cards in a little envelope? It has the Newport Bridge on the cover. I wanted to find those before I posted this, but I have no idea where it would be. I’m sure I’ll come across it in the near future. Keep in touch! Let me know when your site has cards up, or, can I post a link to your site from mine? Thank you for putting up one of the best–read: articulate and comprehensive–blogs around. I downloaded the Finney story for reading on my Palm later. Finney (“Time and Again”) is one of my favorite authors. Thanks, Walt! That means a lot. And I’m glad you’re going to read that story. It’s truly masterfully done! Nice entry….Ah, change…never easy but so necessary. Thanks, Mo! I think I forgot to put the part in where I mention that sometimes when you’re about to take the leap it’s best to think happy thoughts. Harder than it sounds!! I loved this blog. It is so well articulated and compelling. Thanks for the very nice link to my site and your kind words. See you in beautiful Newport soon. Rock on! It was so easy to re-visit the place with those awesome photos. The colors are so great it really is just like being there! Great stuff, K! Life really does imitate story sometimes, doesn’t it? Oh, scary, Lon! Yes, it does! !